At Bark Pet Photography, we want to spread the love and hope you do too! Here's your chance to earn a FREE photo session while also giving back to local animal rescues in need. Through Club Bark, both local and non-local members can easily start earning their way to a totally free session. If you live more than 30 miles outside of L.A. (even in another state entirely), Bark Pet Photography can still come to you with a totally free session. All you need to do is book (6) of your friends at our out-of-state rate: $500 for Package 1 (covers travel expenses for photographer and assistant). Your session will be entirely free AND we'll make a $150 donation to a local animal rescue organization in your area! A 50% deposit will be due from all (6) participants at the time of scheduling, with the remaining 50% due at time of the shoot. Let's recap: you tell your awesome friends how cool Bark is, your totally awesome friends love the idea, you coordinate a weekend date that works for all of you, we shoot all of your pets over the course of that weekend, you get a $500 session and a local animal rescue gets a $150 donation! Capiche? Use the form on our contact page to sign up today (make sure to put "I want to join Club Bark" in the comments section)! 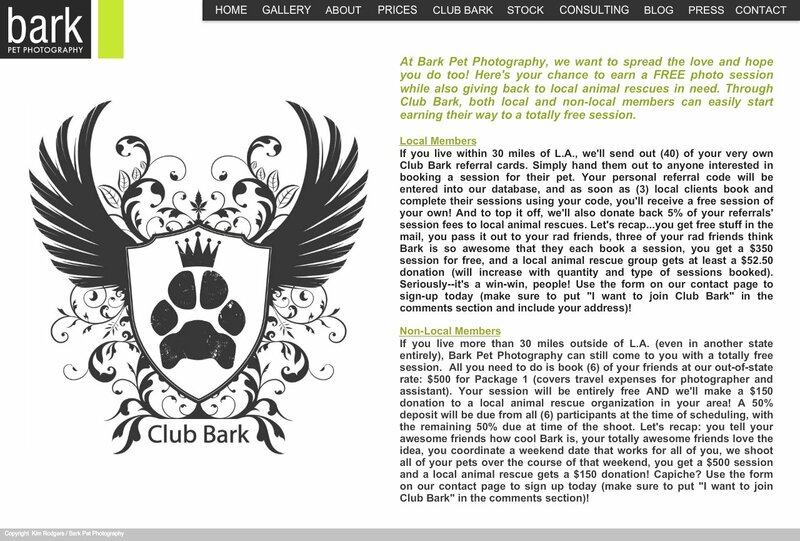 If you live within 30 miles of L.A., we'll send out (40) of your very own Club Bark referral cards. Simply hand them out to anyone interested in booking a session for their pet. Your personal referral code will be entered into our database, and as soon as (3) local clients book and complete their sessions using your code, you'll receive a free session of your own! And to top it off, we'll also donate back 5% of your referrals' session fees to local animal rescues. Let's recap...you get free stuff in the mail, you pass it out to your rad friends, three of your rad friends think Bark is so awesome that they each book a session, you get a $350 session for free, and a local animal rescue group gets at least a $52.50 donation (will increase with quantity and type of sessions booked). Seriously--it's a win-win, people! Use the form on our contact page to sign-up today (make sure to put "I want to join Club Bark" in the comments section and include your address)!